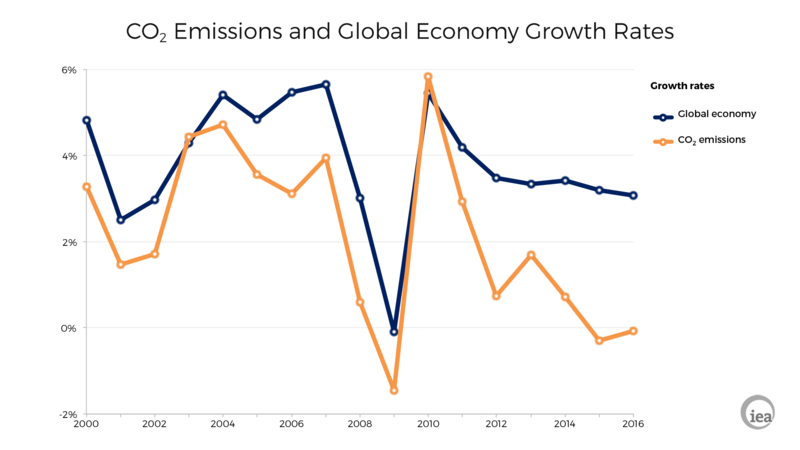 In two previous articles I made a point that seems inarguable but that advocates of emission cuts seldom acknowledge: the only worthy metric of progress in reducing emissions is the CO2 intensity of GDP, which one could also call CO2 efficiency. Looking at absolute emissions is absurd because absolute emissions depend largely or mostly on GDP and the growth thereof, which are of course unknown (especially if we’re making projections about the year 2100!). In any case, climate policies aren’t supposed to reduce emissions by reducing GDP; sometimes advocates of emission cuts even brag about the economic benefits of their policies. So they can only work by reducing CO2 intensity, which is to say by increasing CO2 efficiency. A second point hardly ever acknowledged is that CO2 efficiency isn’t static: it’s growing most of the time, in most places. It would have grown without the COP meetings and it did grow before the Kyoto agreement was signed – at a faster pace than thereafter. Since CO2 efficiency is nearly always rising, using an absolute value doesn’t make much sense, especially for comparing progress across different countries and eras. Of course CO2 efficiency was higher in 2015 than in 1965, but that doesn’t mean the policies were better in the former year than in the latter. Likewise, the fact that Sweden is more CO2-efficient than India tells us nothing about the effectiveness of each country’s policies. What matters is the rate at which CO2 efficiency rises. The ‘rate of increase in CO2 efficiency’ is a mouthful, so instead I call it the rate of decarbonization. They must think GDP was invented in 2000! Guess what happened before that year? Ooops: turns out the decarbonization seen in the last three years isn’t that ‘abnormal’ by historical standards. It’s higher than the average, but then the 2000-2013 period had abysmal rates. 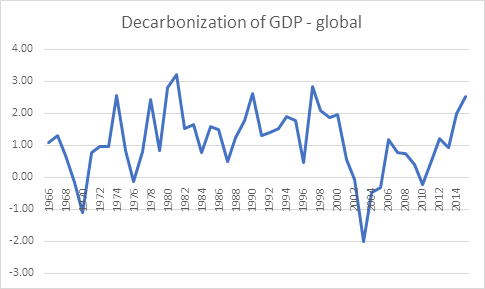 And, no matter what starting period you choose (Kyoto 1997, Energiewende 2000, etc), the period during which decarbonization policies were implemented had a slower rate of decarbonization than the previous. (I couldn’t update my chart with 2016 data because BP hasn’t published those emissions yet. But every time someone claims climate policies have achieved this or that, send them the second chart). GDP growth remains constant at the 2011-2015 average, i.e. 2.7%. In reality, GDP growth has been decelerating; constant per capita growth would make more sense. But I wanted to be ‘pessimistic’ emissions-wise. The fraction of emissions that remain in the atmosphere is 45%. Under the ‘do nothing’ scenario, concentrations reached 754ppm by the end of the century; that’s 22% more than under the ‘do something scenario’ (619 ppm) and, due to the logarithmic effect of CO2, it’s equivalent to 28.5% of a doubling of CO2; 1.35ºC x 0.285 = 0.38ºC. What would have happened if we’d done something? Here’s where it gets hilarious. Some claim not only that we could avoid the allegedly bad stuff that will happen by the year 2100, if we would only start decarbonization now. 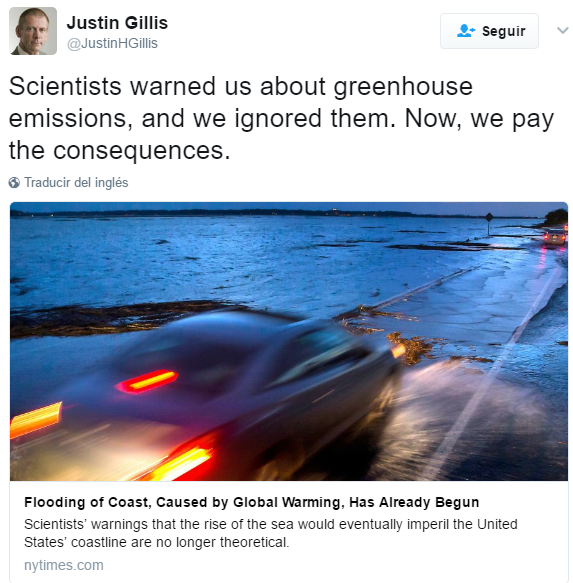 They claim that we area already seeing the impacts of our emissions – and that these could have been avoided! Well, well, the Charney report came out in 1979 and was the first official assessment of climate sensitivity and anthropogenic global warming; hardly anyone outside the scientific community was reading on the topic before that. So let’s assume that, way back in 1979, the whole world saw the light and started decarbonizing. And let’s do the math. Over 1979-2015, the world emitted about 890 billion tons of CO2 from fossil fuel combustion; the rise in CO2 concentration over the period was of 50 parts per million (roughly from 355 to 405). It takes 7.81 billion tons of CO2 to add 1 ppm to the atmosphere, so we actually ‘emitted’ 890,000 / 7,810 = 114 ppm; the airborne fraction, i.e. the emissions that remained in the atmosphere, was 50 / 114 = 44%. Or thereabouts. Nobody knows what the airborne fraction would have been if we had emitted less CO2, so I will simply keep that 44%. Now, if the decarbonization rate had been 1% faster, we would instead have emitted 732 billion tons of CO2. Wow! That’s 158 billion tons less! But wait a sec. All these tons add up to just over 20ppm. Even worse: with an airborne fraction of 44%, the actual difference in concentrations by 2015 would have been only 9ppm. Now you see why illustrating this with a chart would be rather pointless – it would show two lines running near-parallel. Basically, if we had started to ‘mitigate’ warming back in 1979, instead of 405ppm we would have ended the period at 396ppm. And how much cooling is that? We multiply 0.0326 by the airborne fraction of 1.35ºC and we get 0.04ºC. That’s right. That’s not a typo. If the whole world had decided to ‘do something’ about CO2 way back in 1979, and we had kept that program going for 36 years, and the program had actually been successful (unlike the measures we did implement), then by now temperatures would be 0.04ºC cooler. All I can say is these policies are, indeed, the height of folly. DATA: I got global GDP data from the World Bank, CO2 emissions from BP, and CO2 concentration from NOAA. I put it all together in this file. ← How Much Profit in that Slice of Pizza?